I've had two of them, plus a two-storey Type 22 version, just gathering dust for a couple of years. Despite the initial intimidation you get when working with something new, I gradually got my head around the various bits and bobs. All that's required to build it is a scalpel, emery board and superglue, plus an ability to airbrush the colours prior to assembly. The walls are now painted and partially assembled, and I plan to do some more spraying tomorrow. Some pictures to be hopefully posted soon. The roof looks a nightmare, but one day at a time, etc. OK. Here's the progress so far. Once all the bits are sprayed, it goes together as easy as any styrene kit, with the usual amount of swearing that you do. As can be seen, I use Lego bricks for attaining straight edges. The roof really does look incredibly difficult and tedious, with literally hundreds of rows of strips to represent the shingles. The loading dock is still to be added. Is it me, or are you depicting the building to be vacant, with boarded up windows in places? Looks very good so far, and I don't see anything here that would be a show stopper to build it yet, the roof does sound labour intensive, but perhaps not difficult. 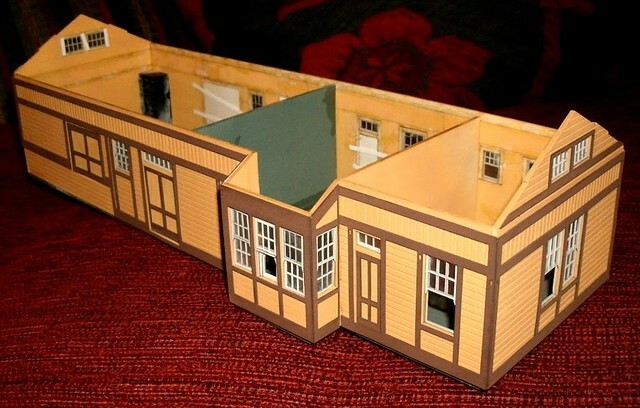 I've modelled three of the depot windows as fully open, Koos. What you are looking at is styrene strapping on the inside, which is supporting the attachment of the double doors of the freight part of the building. You can't see that from the outside when the roof is on. Almost finished the depot. I didn't use the hundreds of strips of paper shingles for the roof, and instead cut sheets of slate styrene, a compromise I'm happy with. Indeed, that slate styrene looks like a very acceptable compromise indeed. And is that 'space board' it is sitting on? Are you starting on your modules? I've read you bought the wood? That looks really good, I hope my type 22 looks as fine when I've built it. You've got me stumped as to where Quisling is on the SP. Thanks, boys. The name is, as you will be aware, Mr Fenton, fictitious. I needed a name of some sort, as it will be on the 16' of modular boards I am about to build, and I don't like using real names for imaginary locations. At the club, I had been gathering a lot of kit for modules based around Emigrant Gap - deep snow, spreaders, flangers etc., but finally, I had to accept that it would be totally out-of-place with the modules the other guys were building. So I had to compromise, and I really did feel a traitor to the Donner Pass plan. That's where the Quisling name occurred to me. 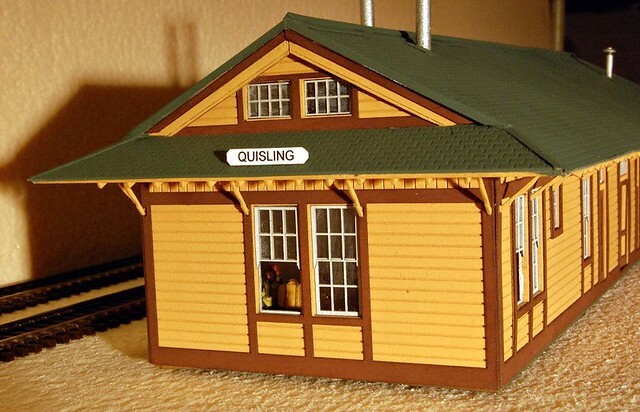 "Imaginary" Quisling is at the end of a Coast Division branch line in California, and has a fruit packing business, a winery, a team and house track, and another industry or two. It's also that rare thing, inasmuch as there is no settlement in the US called Quisling; there's a Quisling Cove in Alaska, a Quisling Park in Wisconsin and a Quisling Cemetry in Kansas, but that's about it. Similarly, another club member who lives nearby, called his boards after our mutual location in Plymouth: Laira. There's no Laira at all in the US. Koos - yes, I put it on top of some foam board to take a few snaps. I'll be using 4 47x20" pink foamboards, surrounded by plywood for the modules. 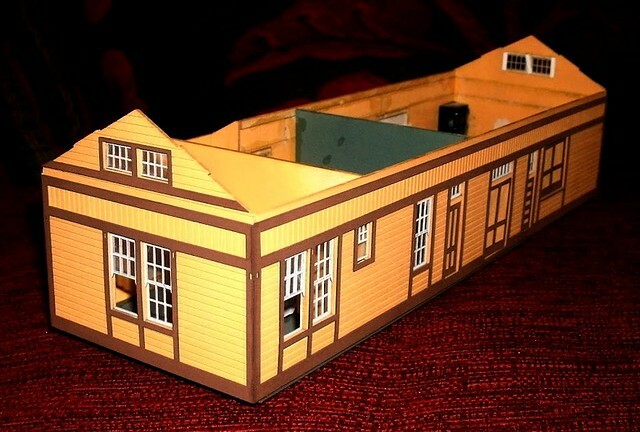 Excellent work Brian - expect you are very pleased with the result; I certainly was after I had recently put together the smaller American Model Builders Standard Depot, that had also been gathering dust for a while. Being my first wooden laser cut kit meant initially progress was slow whilst working out the methodology behind the construction process.. Applying the individual self adhesive shingle strips for the roof, and ensuring they lined up correctly was also rather time consuming to say the least, so can fully understand the thinking behind your roof! igadget wrote: Excellent work Brian - expect you are very pleased with the result; I certainly was after I had recently put together the smaller American Model Builders Standard Depot, that had also been gathering dust for a while. Yes - very satisfying. When I looked at the supplied shingles in detail, some were rather perished and damaged, and not useable anyway. I found that the styrene slate-effect roof actually took an age to do; getting the four rather eclectic shapes to fit onto the wooden ones and then to marry up in three dimensions involved a lot of naughty words. But filler and paint (as we know) can cover a lot of sins. I also sprayed the window frames -a couple of light coats of white did the biz. I now wish I'd placed at least one of the sash windows half-open, to give some variation. Heigh ho, etc. But it will serve well as the focal point of the planned modules. The next job is to knock together an inch-wide, three-feet-long fruit packing house for one side. I hope to buy the styrene next week. Overall: Vajello Dark Flesh 70927 airbrushed. The latter is more regularly used for military modelling, but of all the colours I've ever examined, it's nearer to SP Colonial Yellow than anything I've come across, so I picked up a couple of the small containers it comes in. Don't let all that soul-searching that Tony Thompson & Co. go through in respect of The Holy Grail (AKA "proper" Colonial Yellow, and where to find it) put you off. On the bottle, it says "do not spray", but I managed it. It would also go on well with a brush. The roof is a bit more subdued than the SP Moss Green that most of the depot roofs were painted, but after a few years in the Californian sun, and on examination of some colour pictures, it's, to my eye, a closer approximation of the reality. I think it looks great Brian. I wouldn't be so worried about the 'correct colour' etc either. Things look quite a lot different under various artificial lights. You might find it's appearance be different from one modular gathering to the other, so indeed go with what you feel looks best, would be my approach too.